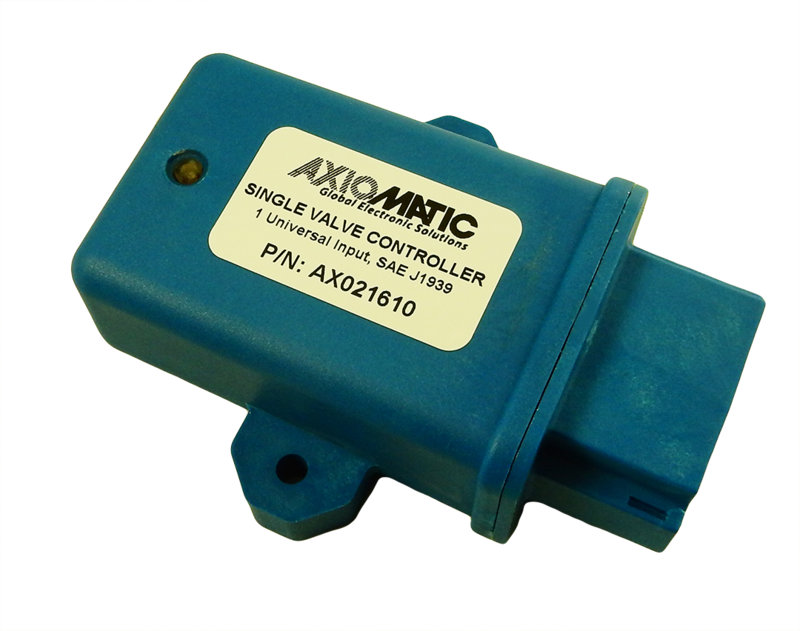 The Universal Input to Single Output Valve Controller with LED is designed for versatile control of a universal input and a proportional valve output. Its flexible hardware design allows for the controller to have a wide range of input and output types. The sophisticated control algorithms/logical function blocks allow the user to configure the controller for a wide range of applications without the need for custom firmware. The setpoints are configurable using Axiomatic service tool, Electronic Assistant® (EA). The universal input can be configured to read analog signals: Voltage, Current, and Resistance as well as digital signals: Frequency/RPM, PWM, Digital, and Counter types. Similarly, the output can be configured to different types: Proportional Current, Voltage, PWM, Hotshot Digital Current and Digital (ON/OFF). Each output consists of a high side half-bridge driver able to source up to 3 Amps with hardware shutdown at 4 Amps. Additionally, the controller includes a dual LED which is visible from outside the housing. The LED can be configured in various ways to visually inform the user of the controller’s operations. It is ruggedly packaged for installation in wet, humid and dusty environments.